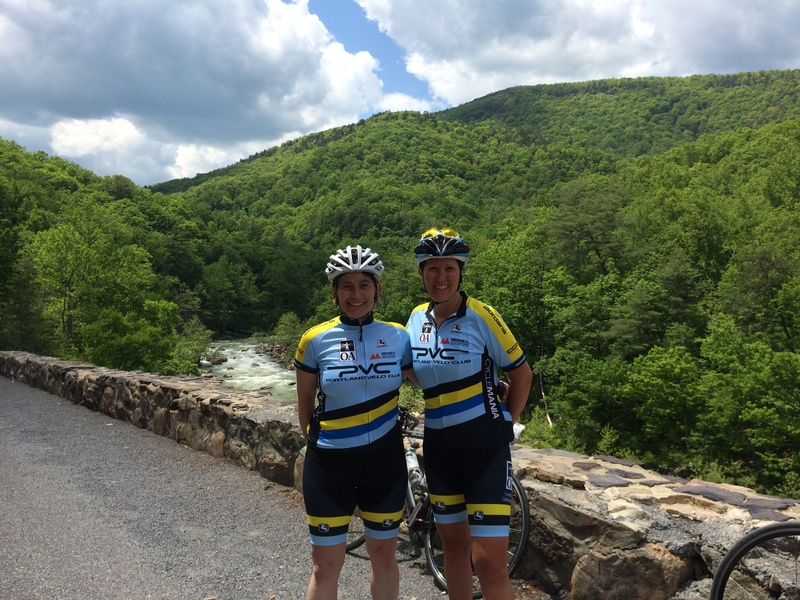 I have a friend that always went to North Carolina for a week-long cycling trip with friends. 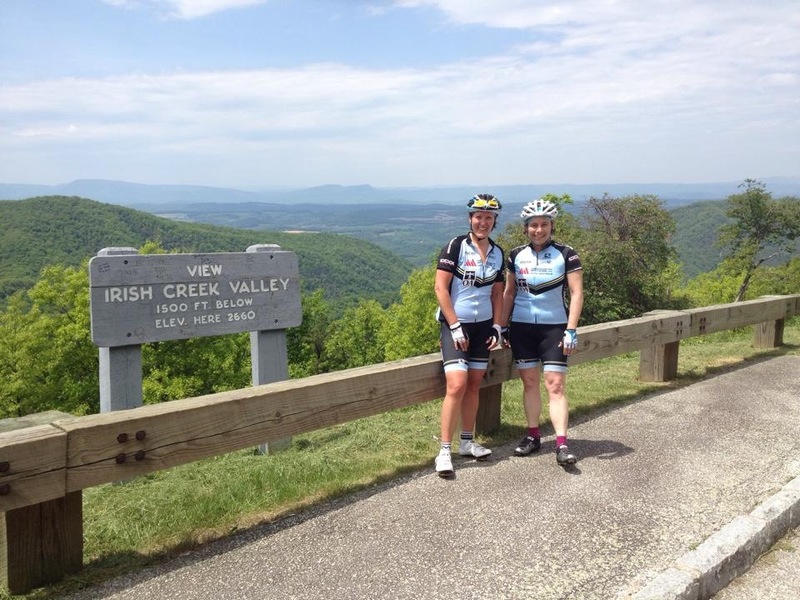 She mentioned lots of climbing along the Blue Ridge Parkway. It sounded like a lot of fun. When I announced that I was moving to North Carolina, my friend put me in touch with her friend that organized the trip. The intent was to hook up and find some cycling in the area. Instead I ended up joining him, my friend, and several of their friends on their week-long trip in May, shortly after my move to NC. 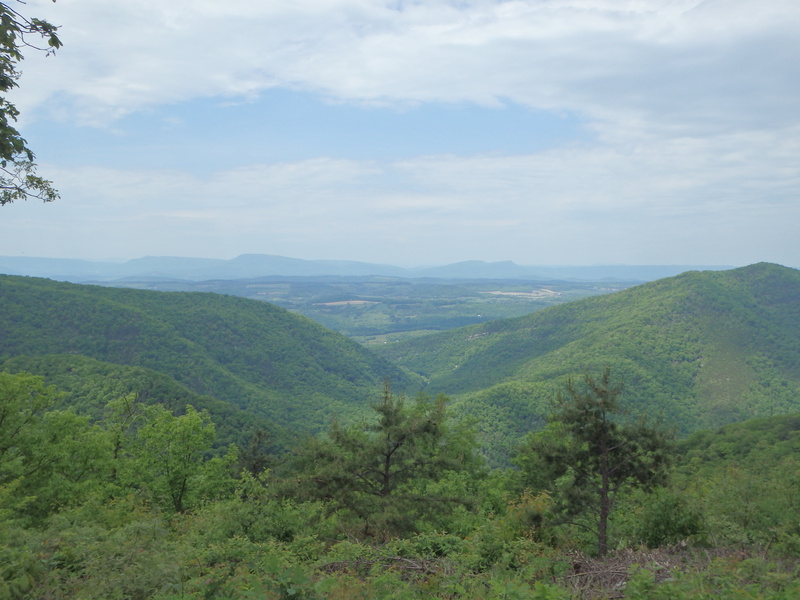 The trip was to take place in Virginia – Lexington and the Hillstown areas. Even though I didn’t have a lot of cycling miles in my legs, I felt I could do it because of the compact gearing on my bike. What I didn’t realize was that the bike I took actually didn’t have a compact crank but a double instead. No wonder I struggled on some of the climbs! And I only found it out when I went back to Maine for a visit in June and rode a bike I had left behind for The Trek Across Maine. I wondered why the gearing felt so different and realized THAT was the bike with the compact gearing. DUH! Even with my poor gearing, it was an incredible week cycling on some gorgeous roads. It seemed like every corner was an “oh my gosh” view. 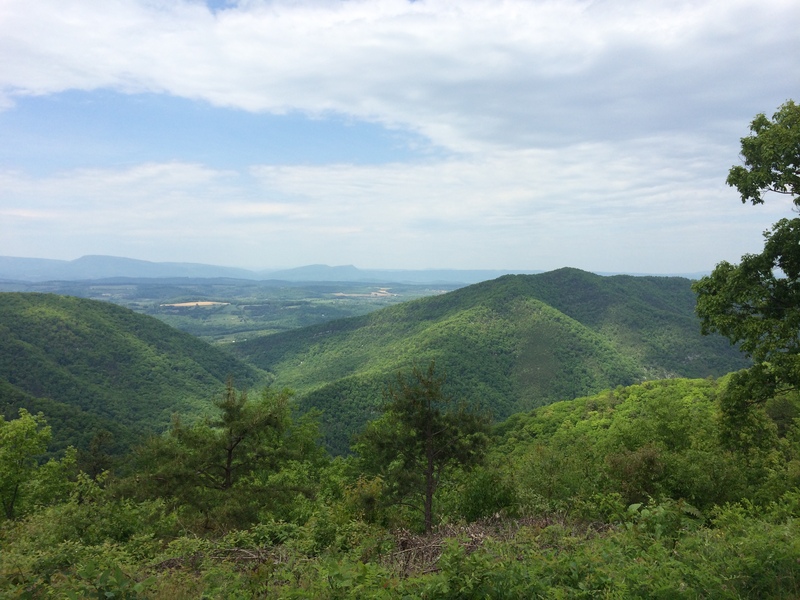 Virginia is a wonderful place to bike! First day pre-ride meeting makes it feel very official. Elizabeth and me at Goshen. Ready for the Vesuvius climb. I want a redo with better gearing! 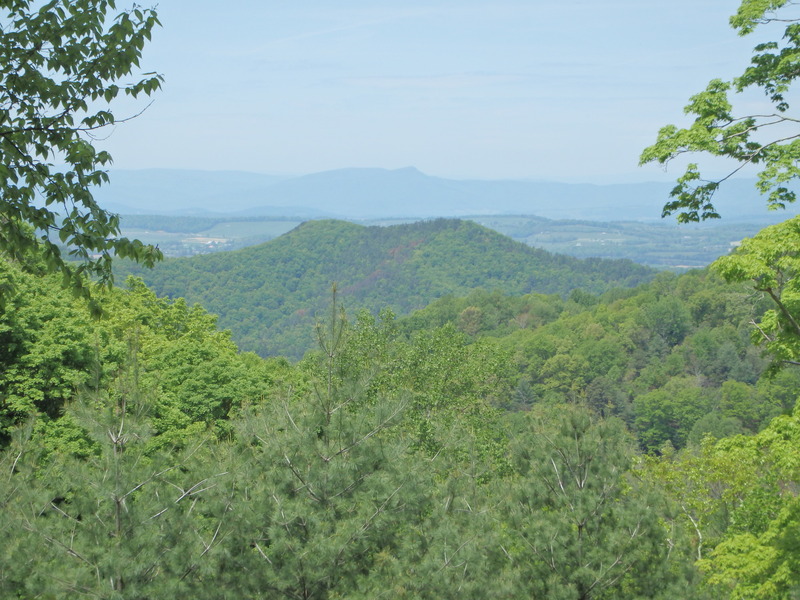 Another great view from The Blue Ridge Parkway. Elizabeth and I in front of another great view. Mabry Mills, one of the most photographed places along The Blue Ridge Parkway. 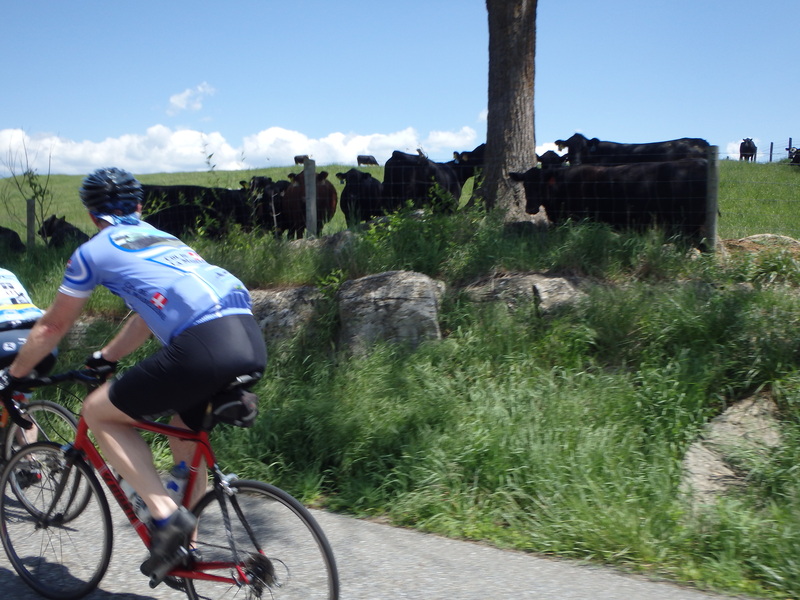 Cows loved to run with us as we biked by. Views from the walk on Vesuvius. Did I mention some outstanding views? 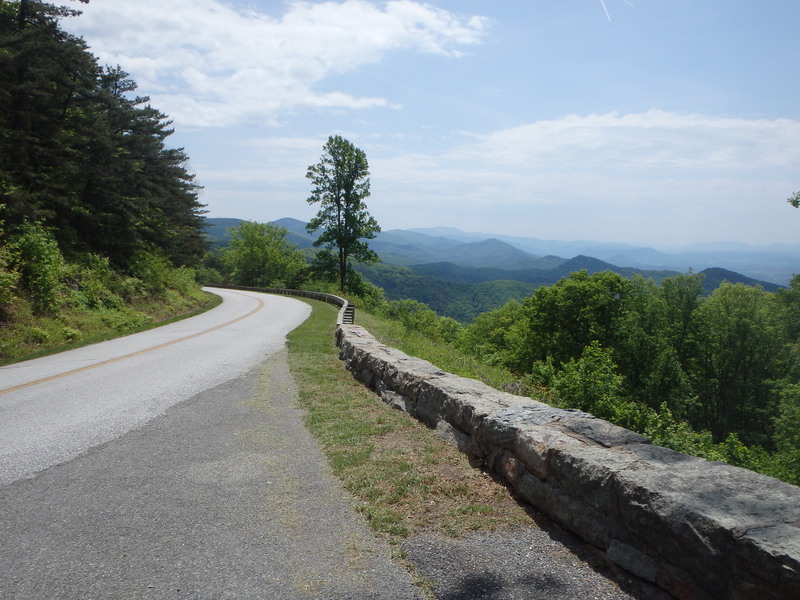 One of the many great views from The Blue Ridge Parkway. Carrying along a small digital camera allowed me to get some great shots of the group in front of me. Trailing behind but enjoying the views. 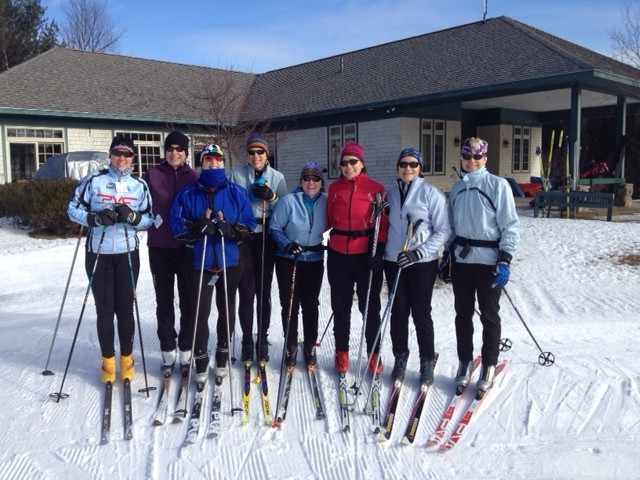 I have friends that are avid cross country skiers and use that as a means to stay fit in the winter months. 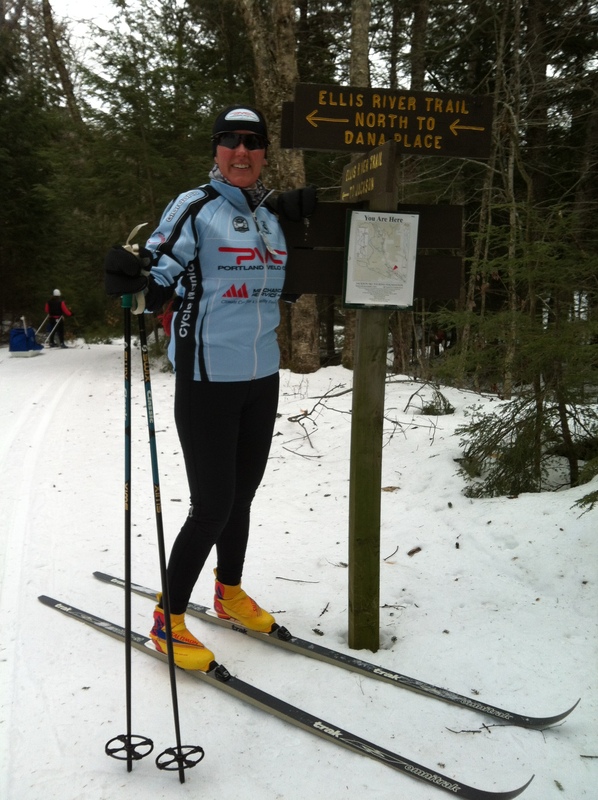 (Or perhaps they use cycling as a way to stay fit for XC skiing.) I had toyed with the idea of giving it a go as a way to keep in shape and to do things with my friends during the off season. I never got around to trying it until a coworker was selling a pair of skis and boots in the winter of 2013 that were my size at a very attractive price. I figured I didn’t have anything to lose so I bought them. I used to downhill ski when I was younger but I didn’t love it and certainly wasn’t good at it. The older I got the more I realized how terrifying it was to go downhill fast without brakes. Also, being deathly afraid of heights was an issue going uphill on the chair lifts. I’d always seem to be stuck on a chair with someone that didn’t want to lower the bar and wanted to swing his/her feet, making the chair feel like it was going to swing back and pour me out several feet below to the earth. No thanks! 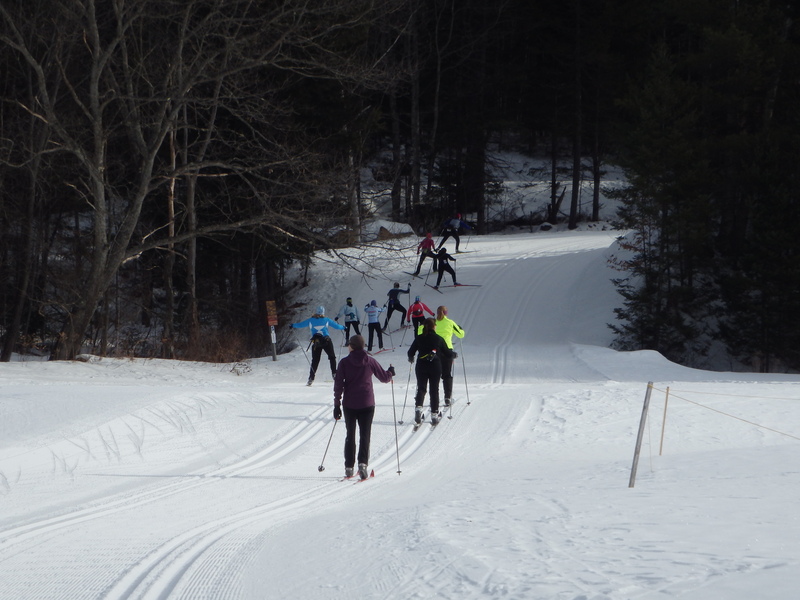 Being blessed with so many friends that are good at XC skiing made it easy to get pointers on what to do and what not to do. I still was never “good” at it, but I did get better and better the more I did it. 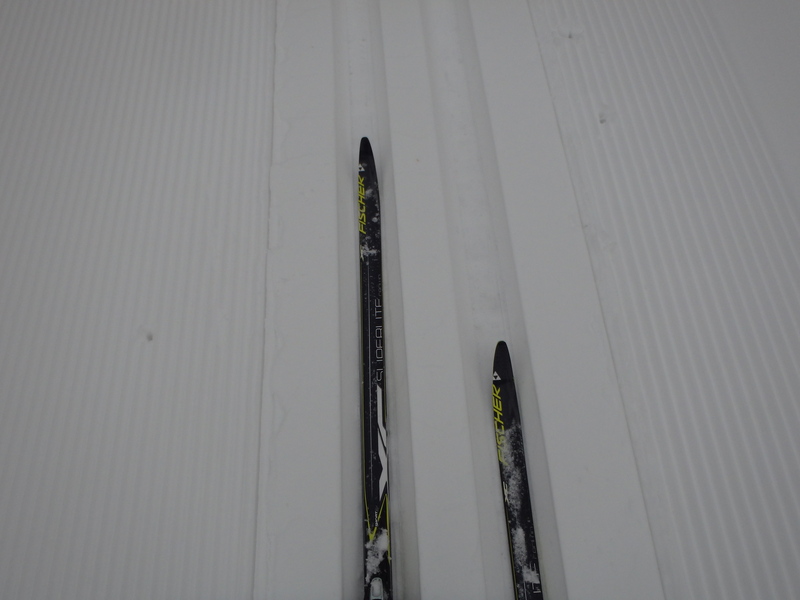 My skis were the classic, wax less kind. With my bad form I was always the slowest one in the bunch. But my friends were great and very supportive in my desire to keep at it and they would always wait for me to catch up. The more I skied with my friends, the more I began to like it. I found myself wishing for lots of snow. Who was this person I had become?? 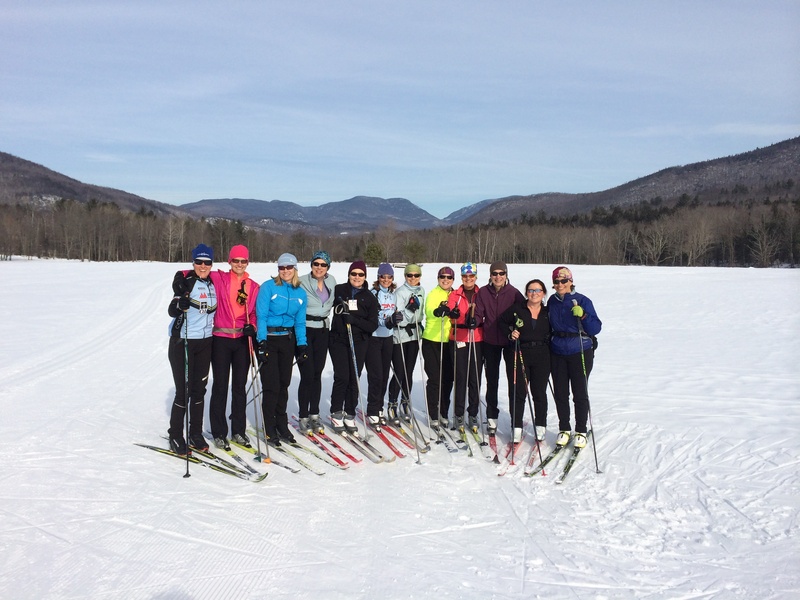 My first ski outing – what a big group! With friends like these, what’s not to love about skiing? 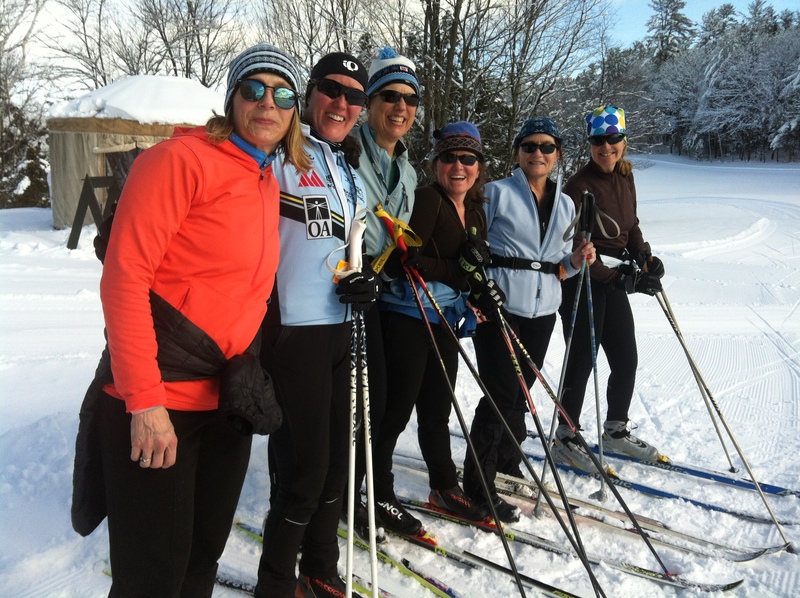 One day a number of us took the day off from work on a Monday to hit the trails at a local ski place, Pineland Farms, following a little bit of snow the previous weekend. It was a beautiful day with blue bird skies, glistening new fallen snow, and gorgeously groomed trails that were nearly empty. It was one of the best days off from work! This was a photo of our group on that day. The views at Pineland Farms are incredible. 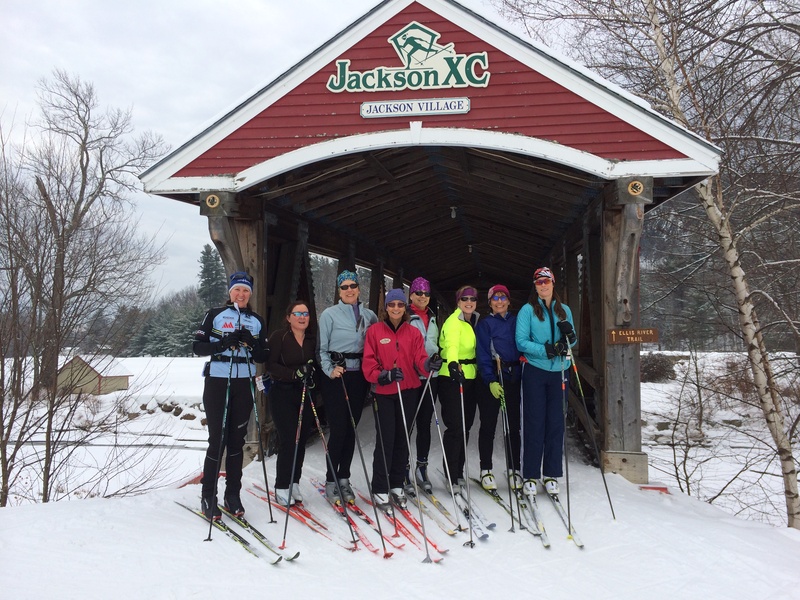 We have a mutual friend that owns a condo in Jackson, NH, right on a the Jackson XC ski trails. In early February we made a girls weekend out of it by driving 2-hours west to stay at her place for the weekend to do some skiing, hiking, along with some great eating and drinking. 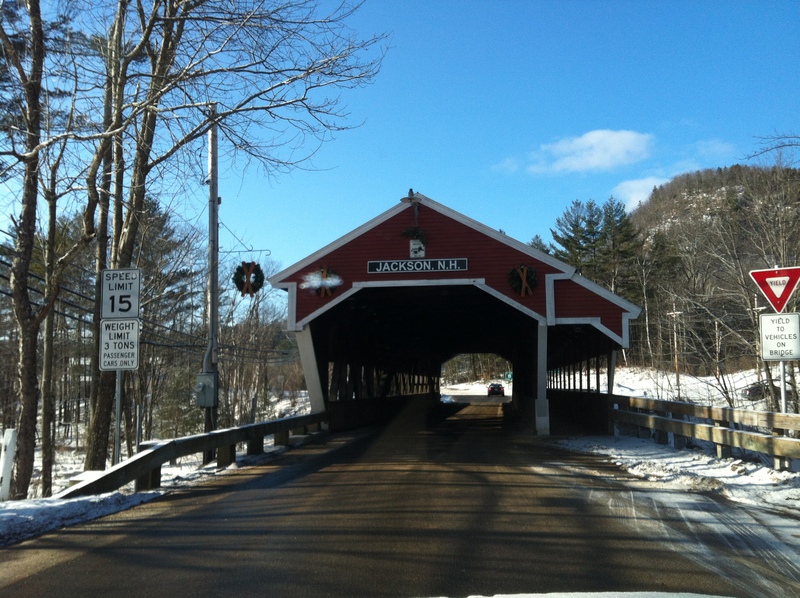 Covered bridge at Jackson, NH. 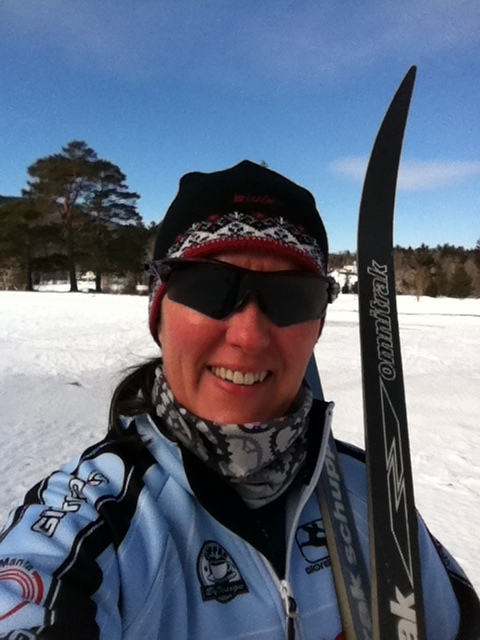 Look at me – excited to ski! I couldn’t resist this photo op! I could get used to this apres ski thing! 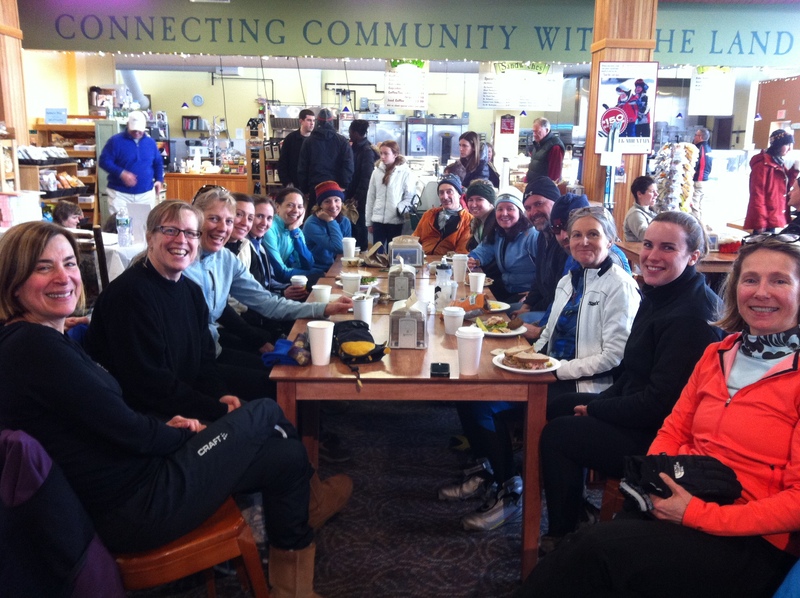 The following year was Jackson 2.0, on the same weekend, but with an expanded group of skiers. It was a spectacular weekend and only reinforced my love for skiing, even though I still sucked, and my admiration for my friends. I had even purchased a new pair of skis, boots, and poles because I wanted to get better at it. First day on the trails with a big group. 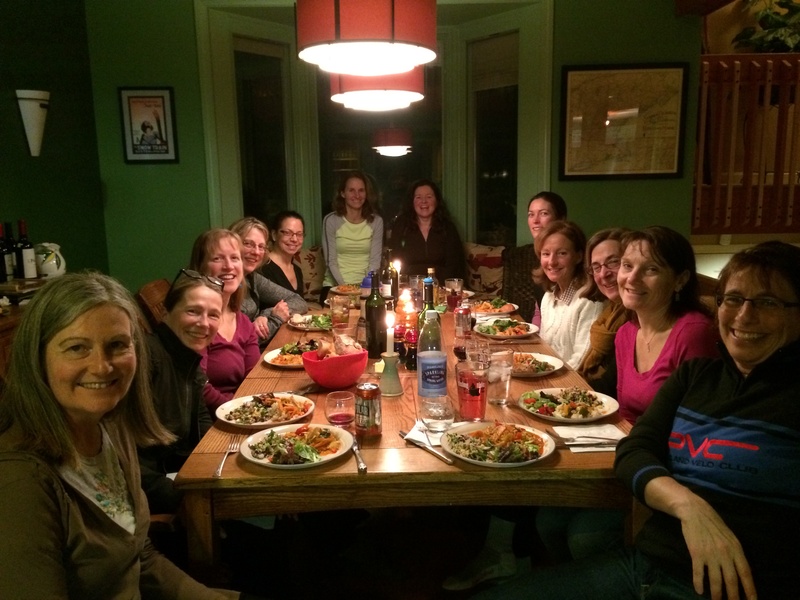 Smiles and dinner after the first day of skiing. 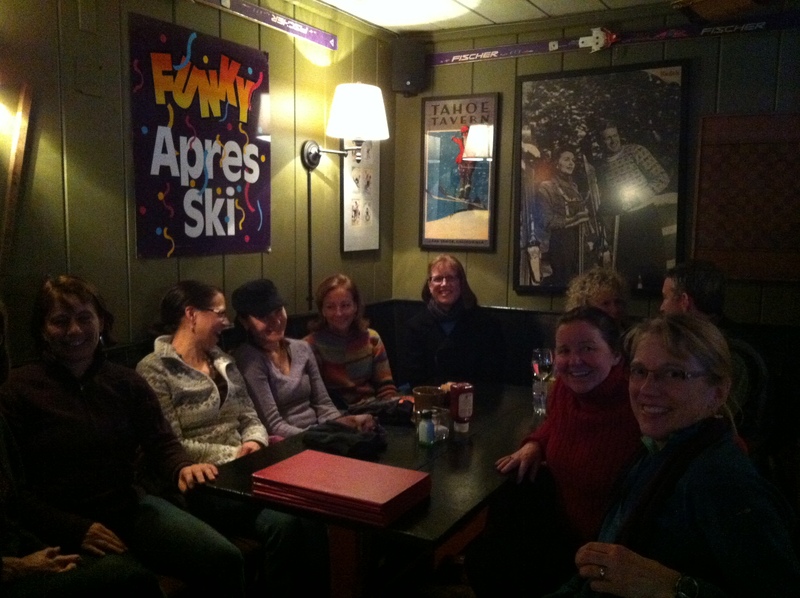 Second day of skiing – we lost a few after the first day. Unfortunately with everything I had to do over the course of the past winter to prepare for our move, I didn’t get a chance to ski nearly as much as I wanted to. 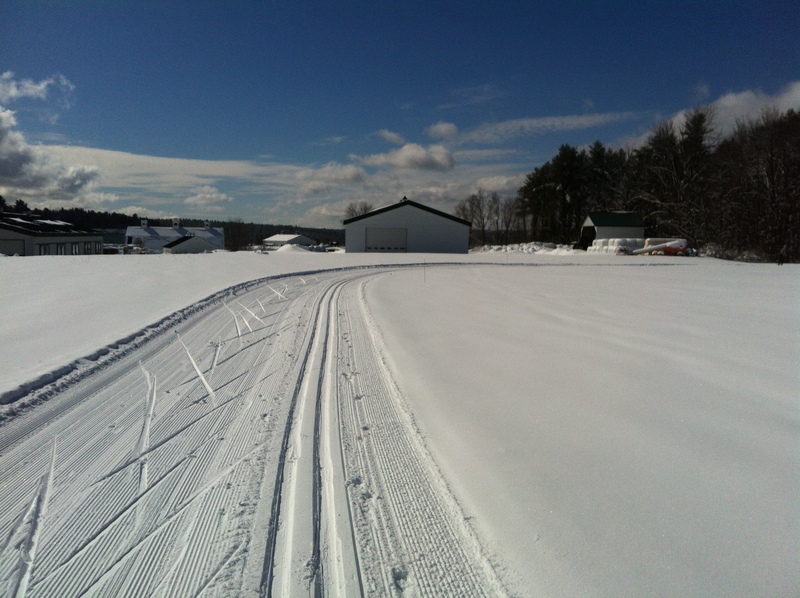 And it’s ironic that as soon as I realized I loved XC skiing and gave me an excuse to look forward to the snow, I was moving to an area where I wouldn’t be seeing any snow. I hope to be invited to Jackson 3.0 in Feburary where I can do a little skiing with my friends then. Our daughter was grown and gone, my mother who I saw rarely lived 2 hours away in the summer but wintered in Florida, and my sister lived in Utah. Sure I had plenty of other relatives but with one grandmother gone and the other on her way out via a nursing home for Alzheimer patients, there wasn’t much family to stay for. 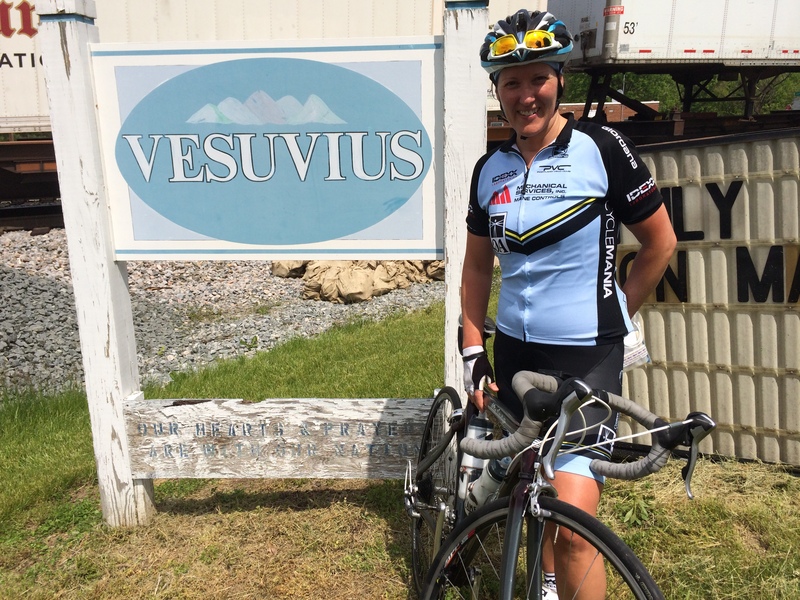 The biggest loss would be some close friends and a strong cycling community that I was a big part of. There was nothing really holding us in Maine. Not to mention I had lived in Maine all my life and the thought of moving someplace without snow, and potential year round cycling, was very appealing. I didn’t hate the snow – it was more of a nuisance and I remember on more than one occasion growing tired of the repetitive snow removal and exclaiming we were going to move to Atlanta. Of course it was mostly in jest. Seriously, I’ve been to Atlanta and it’s probably not some place I’d really want to live. Soon after my husband’s project ended, things changed at his office. 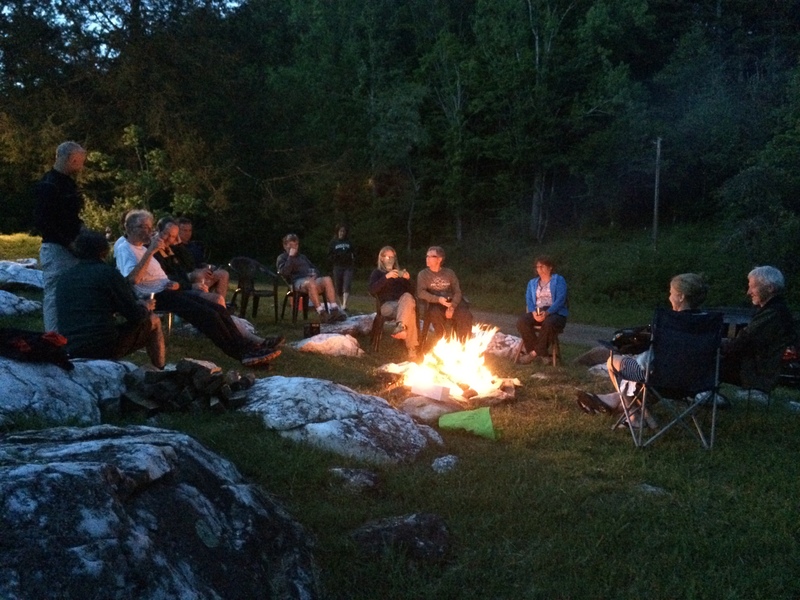 There was a reorganization that resulted in several people being let go and new ones to take their place. It ended up being a good opportunity for my husband and after several months he ended up with a new position in the company. That also meant a move to North Carolina where his team would be located. I was more than overjoyed. My boss didn’t see it that way. After working for him for almost 7 years he was completely blindsided by the news. We had a great working relationship and I never gave him any indication that I wasn’t happy with my job. It was a new opportunity for my husband and I fully intended to support him. Our biggest decision to make was whether to sell the house or keep it and rent it, being 900 miles away. If we kept it and rented it, and if North Carolina didn’t work out, we’d have our house to come back to. In the end, we thought selling was in our best interest. My husband started work the first of December at his new office in North Carolina, just north west of Charlotte, and I stayed behind to pack and prep the house for sale. At the end of March 2014 we removed the snow tires from the vehicle, packed it full of all our remaining belongings that hadn’t been packed in the POD or shipped via UPS, which also included two new adorable feline additions to our family, Athena and Hercules, locked up the house one last time, and left at 4:30am for the 15 hour journey south. I say this more to me than to you, if you are still there and interested in reading. I can’t believe it’s been years since I’ve posted to this blog. However, I felt it was time. You see, the big reason is that I have moved from Maine to North Carolina as of the first of April this year. (No, I won’t be changing the name of the blog to North Carolina Velophile. I consider myself now and always a Mainer.) It’s been an exciting change for me and I’m looking forward to living in a climate where I can ride my bike all year long. That said, my life has definitely changed a bit. Not that it’s a bad thing, it’s just different than when I was in Maine. For starters, I’m not working. So I have a lot of time to devote to household chores, yard work, and growing some wonderful veggies and flowers in containers on our deck. 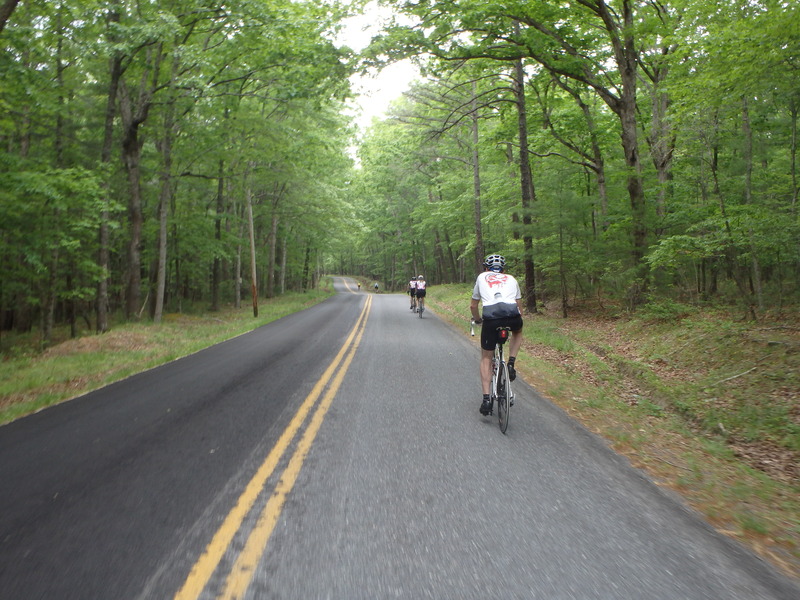 I must say that riding has taken a back seat at various times throughout the summer but I am still in the process of exploring group rides in the area as well as other roads to ride. Stay tuned as I write about my adventures south of the Mason-Dixon Line. I’ll try to incorporate some of my day-to-day adventures in addition to talk about things that have happened over the last several months upon my arrival. It really has been a great experience and I am excited to get much of recorded here on my blog. On May 22, 2010, the Cumberland County YMCA will host their inaugural ‘Tri for the Y’ Triathlon. Tri for the Y is intended to encourage participation by people with a variety of fitness levels and competitive experiences. They encourage families to participate so they are allowing ages 12 and up at this event. They will also offer babysitting for those who cannot participate on a first come first serve basis. The Y will also be offering a slate of pre-event training clinics, designed to encourage first-time triathletes to participate. The Cumberland County YMCA is committed to offering programs and services to the community that promote a healthy spirit, mind, and body for all, regardless of ability to pay. To that end, they turn no one away because of an inability to pay. The money raised at this event will go toward our financial assistance program. In total, the YMCA provided more than $560,000 in financial assistance to members of our community last year. 1 in 3 members of the Y received some form of financial assistance in the past year. The proceeds from this event will ensure that they continue to make our programs and services accessible to all. In addition to supporting a healthy community, your participation in this event will provide you with an enjoyable day of family fun! If you have questions, or need any further information than is provided on this website, please do not hesitate to contact them at triforthey@cumberlandcountyymca.org. A friend of mine is turning 40 this year. In celebration of this milestone in her life, she is taking on 40 interesting challenges such as listening to some new music, random acts of kindness, and carrying on a tradition established by her mother. Many of these challenges have a “40” reference. For some lighthearted reading over the next few months I recommend you check out Jennifer’s blog, Forty for 40. Perhaps you will find inspiration for your own milestone birthday, or just everyday life, as she turns 40.